DENVER (AP) With the core of Colorado’s scoring attack sidelined, backup goalie Jonathan Bernier put together a stifling performance. Colorado returned from a six-game road trip and won its ninth straight at the Pepsi Center, the club’s longest home winning streak since moving to Denver in 1995. The Avalanche are 19-7-1 at home this season and one point out of the second wild card in the Western Conference. They’ll have to find some more offense, too. Colorado struggled to generate many chances without Nathan MacKinnon (left shoulder) and Mikko Rantanen (lower body), the team’s top two scorers. In their absence, the Avalanche were outshot 39-20. The Avalanche added to it as they connected on two long passes to set up Jost. The 19-year-old split two defenders just in front of the blue line and beat Jones’ glove for his fourth of the season. NOTES: C Joe Thornton missed his sixth straight game and is expected to be out several weeks for San Jose. … Jost and Compher each had a goal and an assist. … MacKinnon is expected be out two to four weeks, while Rantanen missed his first game of the season. 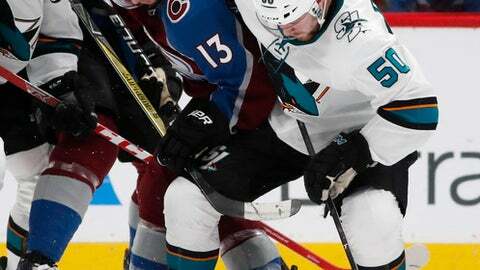 … The Avalanche are in the midst of playing 13 of 16 games away from home. This story has been corrected with Bernier’s save total to reflect official scoring change.